We’re two full weeks into the college football season and new faces are starting to emerge all over the country. The Big Ten’s quarterbacks are one area where new faces are emerging, and emerging big time, especially on our list of highest adjusted completion percentage. About them being newcomers, take, for instance, three of the top five performers below are in either their first year at their respective universities or their first year on a college campus. Blough entered the 2018 season with the highest adjusted completion percentage among returning quarterbacks and that has carried over into this season. On the year, he’s fielded eight incomplete passes – four of which were dropped and another was thrown as he was being hit. It’s a one-game sample size and while we’re still unsure about whether he’ll play this weekend or not, Martinez sure did his best to keep Nebraska in the game against Colorado. He completed 15-of-20 passes and saw one pass dropped and another batted at the line. The much-talked-about Michigan quarterback has completed 32-of-47 passes this season, his debut campaign in Ann Arbor after transferring from Ole Miss. Three of his passes have been dropped by receivers while an additional pass has been thrown away, one batted at the line and he’s uncorked two passes as he was being hit, each of which not counting towards his adjusted completion percentage. Ramsey is the first quarterback (and only one of two) in the Big Ten to not have a single pass dropped by his receivers this season. He’s completed 36-of-48 passes while recording two throwaways and another pass batted at the line of scrimmage. Haskins is the other conference quarterback without any dropped passes this season as he’s completed 42-of-53 passes. He remains the only conference quarterback at this time to not have a single throwaway, drop, batted pass, spiked ball or a pass that was thrown as he was being hit, meaning his basic completion percentage is also his adjusted completion percentage. 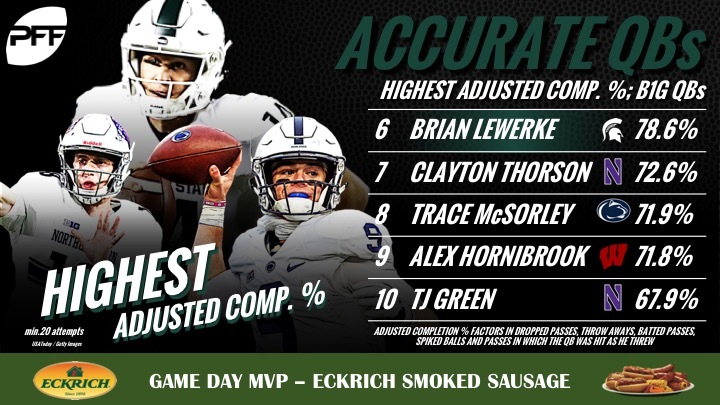 Lewerke finds himself planted here at No. 6, having thrown the most pass attempts among conference quarterbacks this season. His 78.6 percent adjusted completion percentage comes on the heels of five dropped balls, another pass was thrown away and one was batted at the line. Thorson has been an accurate quarterback all four years in college, improving his adjusted completion percentage every year to a career-high 72.1 percent last season. He’s on pace to break that career-high as he’s completed 39-of-65 attempts with six dropped passes and another three throwaways to his name this season. The Penn State signal-caller has been subjected to the second-worst drop luck in the conference, behind Blough. McSorley has had 12.5 percent of his pass attempts dropped by his intended targets (eight total) while he’s also thrown away a league-high five passes this season. Hornibrook, currently the conference’s highest-graded passer, isn’t quite the poster boy for completion percentage this season. When you break it down by adjusted completion percentage, however, the numbers look a bit better. Of his 18 incomplete passes this season, Hornibrook hasn’t been charged with seven of them, having three dropped, one throwaway and another three spiked passes not count towards him. The son of NFL great Trent Green, TJ has seen spot duty for the Wildcats this season but by virtue of his 29 pass attempts, makes the cut off here. He’s connected on just 16-of-29 passes yet has been subjected to three dropped balls and had another throwaway.